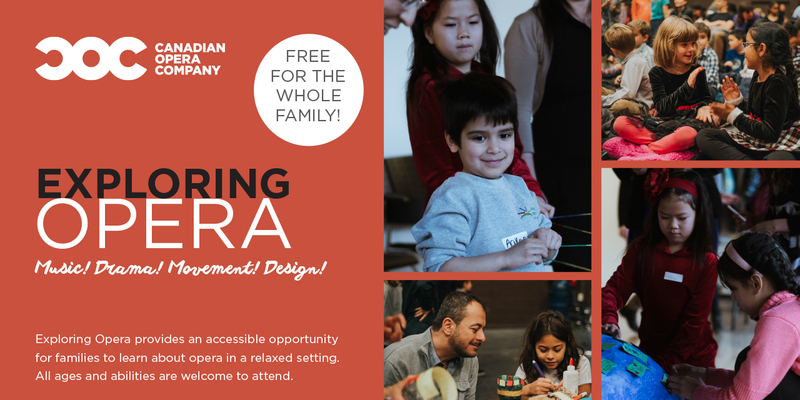 Exploring Opera workshops are FREE events for families that take place at the Four Seasons Centre for the Performing Arts. No previous experience with opera is necessary. Registration is limited and will be granted on a first-come first-served basis. COSI FAN TUTTE FRIDAY FEBRUARY 15, 12:30 - 1:30 P.M. Explore Cosi fan tutte through MUSIC! DANCE! DRAMA! and DESIGN! Friday February 15, 12:30-1:30 p.m.
LA BOHÈME FRIDAY APRIL 26, 4:30 - 5:30 P.M. Explore La Bohème through MUSIC! DANCE! DRAMA! and DESIGN! Friday April 26, 4:30-5:30 p.m.
OTELLO FRIDAY MAY 17, 4:30 - 5:30 P.M. Explore Otello through MUSIC! DANCE! DRAMA! and DESIGN! Friday May 17, 4:30-5:30 p.m.